Renewable energy systems generate DC power, but normal household appliances operate on AC power. The inverter's job is to take that incoming DC power, be it from solar panels, batteries, and convert it to AC so you can use it. Micro inverters convert power right at the panel. They are the best option for systems with partial shading. Central inverters are more efficient than micro inverters in ideal conditions, and their cost per watt is lower. These inverters can both charge batteries and draw energy from the utility grid as needed. Off-Grid inverters are designed to work with batteries completely independently of the utility grid. Pre-Wired inverter systems come with all the components you'll need already hooked together to simplify installation. 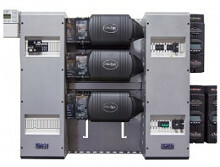 These large inverters are designed for commercial use in industrial areas. There are many different types of inverters; the most important factor in choosing yours is your application. Will you be tied into the utility grid, completely independent of it, or a combination of the two? Is there partial shading where your solar panels will go? The FLEXpower THREE FXR Systems are designed for 120/208VAC 60Hz three phase applications with medium sized power requirements, such as light commercial or larger backup power systems. FLEXpower THREE systems are offered in 9kW and 10.3kW configurations. Click here to view the OutBack Power's FLEXpower THREE Inverter line.